These are just a few of my favorites. Enjoy! Thank you PC for these interesting research for us to go over, I was always wondering what supported your books. I like it. This is neat! Wiccan traditions, among others, have always interested me; also the thought of someone possessing elemental powers has always been intriguing! I am extremely pleased that you chose to write a multi-cultural YA series! The HoN is one of my favorite series, and I thank you much for writing them!! Thanks guys! I forgot to mention that I also enjoy reading Sage Woman magazine - for research and pleasure. Hi I really heart yr HoH series, I wanna know if there will be paperback version for Hunted and if yes, when will it be published? Oooh! Very interesting titles. I must check some of these out. Thanks! PC I'm so confused my Bible teacher says that the Wiccan religion is linked to satan. But when I researched it, I found nothing on it being related to satan. I think wiccan is a beautiful religion. And I'm a christian! Just because I don't believe in it doesn't mean I think it is wrong. Why do people see it as evil? y not hardback? Ive always been fond of hardback books. OK THIS IS A RHETORICAL QUESTION. LL - you make me smile. Rhetorical question so you don't get in trouble...hee hees. Excellent question Nicole! People believe Wicca is satanic because they are uneducated about Wiccan beliefs. The first tenant of the religion is "Perfect love - perfect trust." Wiccans also believe that what they put out will return to them three fold. So people who believe witches put spells on people and do dark, evil things are misinformed. For a true Wiccan, putting out negative energy, wishes, spells, etc., would mean she would have that returned to her life times three. Wiccans, and Pagans in general, do not believe in Satan, and absolutely do not worship him. Sadly, many Christians refuse to research any other religion, this includes Jewish beliefs, Muslims, Buddhists, etc., and instead judge anything outside what they believe as not simply wrong, but evil. One of the basic themes in the HoN books is that this kind of narrow minded viewpoint is destructive. It's people like this who think Kristin and I are "being mean" to Christians in the series, when that's not the case at all. What we're doing is taking a stand against those who judge others. Zoey herself realizes in UNTAMED when she meets and becomes friends with the Catholic nun, Sister Mary Angela, that she is just as wrong lumping all Christians into a negative pile as her step-loser is in his attitude toward anyone who believes differently than he does. I Understand that you are hard at work writing TEMPTED for our enjoyment, so let me say that I appreciate that! I love that you are a dedicate writer and that writing zoey and everyone elses story is as important to you as reading it is to us. I also wanted to say that i ordered some jewlery from the firegoddess website and i absolutely adore it! I have zoeys dark daughters necklace and i also have spirit as my elemental tag. Again i just wanted to say thank you for writing your story the way you envision it, and as long as you continue writing, I'll continue to buy! An Appreciative Fan From N.Y.
PC - I just finished the first H of N book and was very pleased with the open-mindedness you just mentioned. I am sure yours is the first fiction book I've read to use witchcraft traditions in such a beautiful manner, not to mention the Cherokee traditions. Thank you for letting me read a new point of view. Keep it up!! BRooklynz Angel - I adore the jewelry that the lovely Fire Goddess has created, and have all of it! She's been talking about creating a new design - can't wait to see what she has in mind! Lisa Anne - thank you! Carrie - I've turned on post moderation, and am finding some of the posts are getting caught in my spam filter, weirdly enough. Sorry about that. I'm on my way to teach a workshop at and key note a speech for the a writers' conference in Wash DC. I'll post more when I return! I just wanted to stop by and say how much I adore your books PC. I have become completely engulfed by Zoey and her friends. It just amazes me how an author can actually create a world that become so real to me, it's like I actually attend the HoN with them! Thank you so much for taking the time to write such wonderful work and for remembering all of us here in your blog! You and your daughter are AMAZING! Keep up the great work!!! I really enjoyed "HUNTED," and I truly enjoy all of your HoN books. I have ALL of your books in their first printing and collect them as soon as they come out. I really miss your adult novels. I think that they are wonderfully poignant and beautifully written fantasy romance and I honestly can't wait until you put another adult book out. I know that because of deadlines and contractual obligations, you probably won't submitting another Goddess Summoning or Partholon novel anytime soon, but as much as I love HoN, it is those books which captured my heart and attention first. And I can't wait until you return to those worlds. Thank you Justin! What a lovely comment. S. Miller - I really enjoy my adult books, too. I do have a very fun adult release this year. In October THE AVENGER will be released through Harlequin's Nocturne line. It's a time travel plot and most of the action takes place in Briton, 60AD. As per usual for my books it has a strong goddess theme with a smart, funny, modern heroine. Also, Harlequin is repackaging and reissuing my adult fantasy trilogy, DIVINE BY MISTAKE, DIVINE BY CHOICE and DIVINE BY BLOOD starting Aug. - Oct. Then in 2010 ELPHAME'S CHOICE and BRIGHID'S QUEST (set in the same fantasy world as the Divine trilogy) will be released through their young adult line. Happy reading! And thanks for asking! Ahh! That darned Spam folder! No worries.. I figured it was something like that. You barely have time to check regular mail let alone the Spam folder. Thanks for the reply! Happy writing! I have a question: Why do some new marked guys have a mentor and some others don't? I mean Zoey has Neferet, Elliot had Dragon, Aphrodite had Neferet... but Stevie Rae (at first), Damien and Twins don't have one and they're all in third class. Hi Airis - all of the fledglings do have mentors, I just haven't mentioned them specifically because it didn't move the plot. But that is a good question! So, yes, they all have them, though they usually only serve as true mentors for a fledgling's first year. Wow, I don't think you like research. . . I think you're addicted to it. JK! Anyway, I think it's nice that you went through all these books (and more, probably)to get all the facts straight. I also think it is really smart that you don't reveal your religion to fans. Good Luck on Tempted, Ms. PC! Will Zoeys mom, step-dad, and her siblings come by any time soon again? I mean, if they ever see Zoey later on and find out she's High Priestess-in-training/High Priestess, I wonder if they'll go "Wow! Zoey's a High Priestess! That's so cool!" ,or (unfortunately), "Ah! OMG! Spawn of Satan! Spawn of Satan!" Anyway, good luck on Tempted! I wanted to tell you (when I met you on Friday) how much I appreciate the amount of research that you obviously do with the HoN novels. I had seen these comments on your blog. Thanks for taking the time to talk to my friend and I on Friday. At the risk of sounding like the gushing 50 year old teenager I am, I just love the brown pop and cat loving, soul searching Zoey and all of her nerd herd. I am looking forward to the next HoN book and the re release of your adult series. I hope Kristin feels better, Sorry we couldn't meet her. My friend and I were the teachers in WV that took the day off to come and meet you guys(I am sure that happens a lot). You were very very nice and it was well worth the trip. It is great to be excited about reading again! My friend and I just gushed the rest of Friday while we shopped about coming to the signing. I have a quick questions so please answer. It doesnt say in the book. What is Zoey's older sisters name? Pinguina - Right now Zoey's parents aren't part of the plot. She's busy at the HoN trying to save the world. Grandma Redbird is with her, and she is the only part of Z's family that's a positive influence. Z doesn't need the stress right now of dealing with her parents on top of everything else. I wanted to say I Love all 5 House Of Night books. I finish all 5 in less then a week. It was so hard to put down. The only thing I wish is at the end after she saved the school and the world when Shark said he loved so much Erik and Heath was shocked I just wish she chose and there was more about what happen with the school.. I do love Hunted I just wish there was a Little more. Do u and ur daughter thin there will be a 6th book to tell us what happened after words? I hope we will be able to see Zoeys family again in later books. I would very much like to know whether or not Zoey and her family, especially her mother, will be able to forgive each other for their past mistakes and try to get closer. I also hope we get to know more about Zoeys siblings. But first, Zoey saving the world! Happy writing and Blesed Be! SophieJean - Yes! Kristin and I are trying to plan another trip to the UK. And as I'm of Welsh descent, I'd love to visit! Originally we planned on touring in August, with the release of UNTAMED, but word from our publisher is they've moved up the release date, so we're having to rethink our schedule. Keep checking my blog and the websites. I'll post updates there. Yes ma'am--I've read them all...and can barely wait for the ones you've got coming out! I just wanted to say that i compleatly agree on your veiw point of the narrow minded people of religion it just drives me up the wall. Expecially when there belives are to do unto others and to not judge others. I don't have a clue about the first chapter posting. My publisher handles that. My guess is it won't be until late summer at the earliest. I know they're even keeping the cover secret right now. (I've seen it and it is GORGEOUS!) If you subscribe to the newsletter though the HoN website you'll be the first to get info, though. I love your books, is there going to be another book after TEMPTED? Lilly, yep - I give details in my other blog posts. Hi! My name is Bella we meet at the realize party of your last book at borders here in Tulsa. Sorry it took me so long to wright but I've been kind of busy. Anyway I still think is a good idea to make a Puertorican character for the nerd herd and if you need any help with Zoey's spanish just let me know. Oh and BTW Looooooooved the book! Hi, big fan by the way! Anyway, I totally wish people had more open minds to things! I was at church once and they told us that all religions were bad and they were wrong exept Christian. Then they tried to get us to convert our non-Christian friands and I said no because my mother told me people have a right to their beliefs and that we should respect them as well! My family is very open-minded. Mostly because of our heritage as being Cherokee and Alqonquin Indian and the fact that I have premonitions like my mother did(and sometimes still does) and farther back into her family as well! Also, I am Christian but research other religions too! I am starting a World Religions class that my mother teaches me along with other classes, seeing as I'm home schooled. I love your books and have read all of them. In fact, I am a Wiccan myself and love the way you present the facts in an interesting way so that, when people who think wicca is devil worship, will rethink the facts and understand the religion to some extent. Hey P.C., Im 13 (almost 14) and live in Florida. I noticed all these weird websites saying that you are a Wiccan. I'm catholic and I totally get that we are very judgemental. My mom was seriously against the thought of me even buying your books because she did research and found it had Wicca in it. 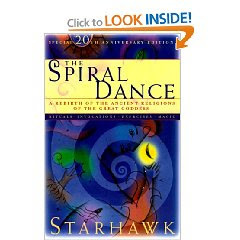 Well last summer, I actually bought a book by Silver Ravenwolf on Wicca. So let ms get to the point, are you a witch, Wiccan, pagan, or neopagan? Kaila, as I explain in this post, I use many different forms of paganism as foundation for the fictional worship of Nyx in the House of Night, not just Wicca. As to my personal religious beliefs - they are personal, and I choose not to discuss them publicly. And as a little p.s. for you and your mom - don't believe everything you read on websites. Hi PC Cast I would just like to say that you did a fantastic job with the books. I am a Hellenic pagan and Hecate is my main goddess and she is like the goddess Nyx in your book. You have done a fantastic job with the research. Thanks for not giving pagans a bad name your the best writer ever. Hi Pc !!! My name is Júlia and i am from Brazil. I absolutely love HoN, no just for the amazing history, but for the fact that you descrive the pagans as people of love, no just some devilish and satanic people that the ignorants think. I cant wait the release of hidden here! Wish that some day i will found one Stark for me LOL I have a huge poster of you and Kristen in my bedroom hehe because i hope some day i can be just a little amazng and criative just like you two! XOXO P.s. When you two come to Brazil can sta in my home ok? Nishmita - a draft of the epilogue of HIDDEN was accidentally published with one of the first editions. There should be no epilogue with HIDDEN. The correct, complete epilogue is available through the houseofnightseries.com website and will be printed as a prologue to the eleventh book, REVEALED. Mary's Grotto - the real one! YALSA Top Ten Book for Teens Nominations! Check out the Library Fun!